If you came directly to this page you may wish to read an introduction to this section first. 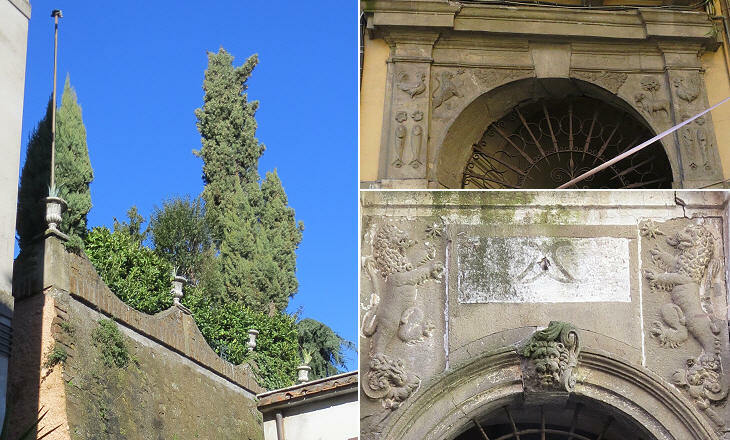 Just below the town (Palestrina) the road descends into a ravine clothed with the most magnificent chestnut trees. It is the bed of a stream enclosed on each side by rocky walls, from which at first the eye seeks an outline in vain. At length, however, a great picturesque bridge appears, crossing one of the head springs of the Sacco, and before us, on a high hill, lies the dark village of Cave, built on terraces of black tufa, but girdled about with vineyards and gardens; and now also the Volscian Mountains come into sight. 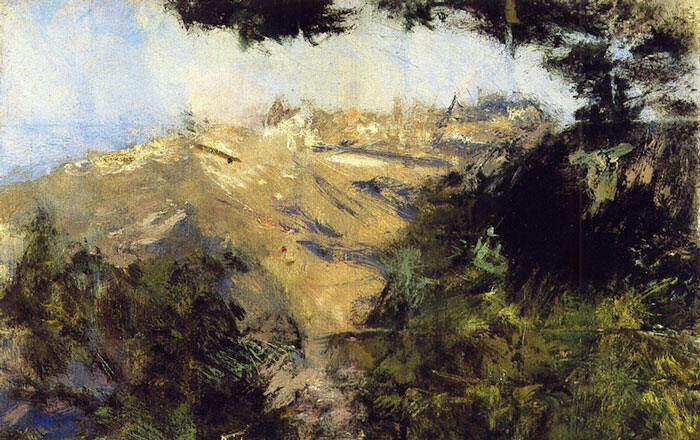 Ferdinand Gregorovius (on his road to Genazzano) - Aus der Campagna von Rom - 1858 - English translation by Dorothea Roberts in Bill Thayer's Web Site (they open in separate windows). Today the road approaching Cave from Palestrina does not follow the route described by Gregorovius. 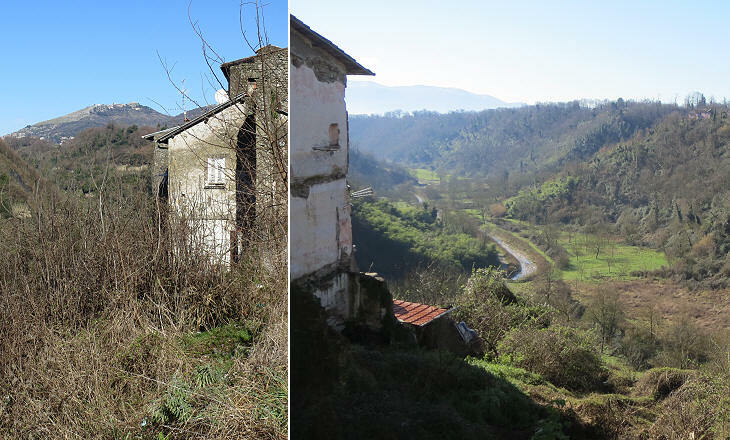 Now it is situated at a higher level with limited views of the ravine which is best seen from the town. You may wish to see a painting by Antonio Mancini (1852-1930) in order to have an idea of how Cave appeared to Gregorovius (it opens in another window). 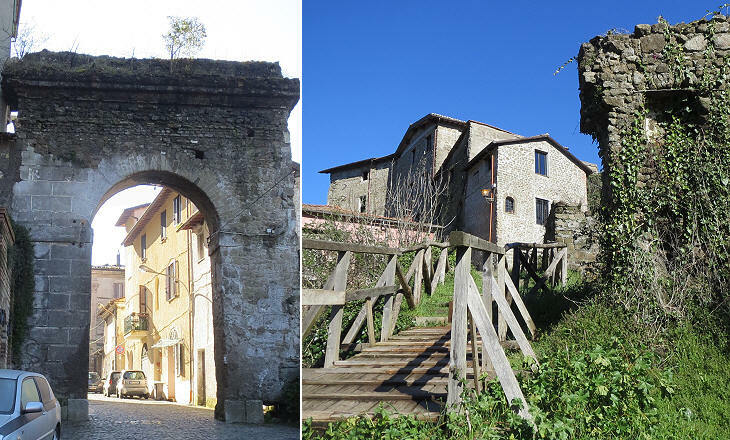 The entrance to Cave along the old road was preceded by a triumphal arch dedicated to Marcantonio II Colonna, Duke of Paliano, who in 1571 commanded a small papal fleet at the victorious Battle of Lepanto. The picturesque bridge described by Gregorovius was the target of repeated bombings by the Allies in 1943-44. The bridge was not hit, but the town suffered great damage. 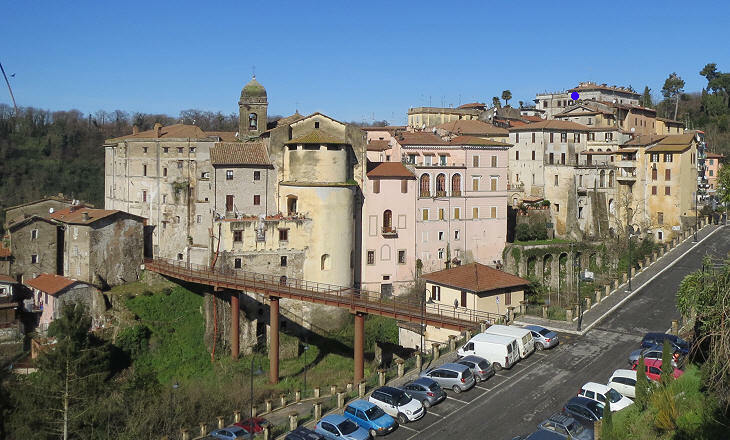 The buildings at its southern end were abandoned as the road from Palestrina to Genazzano was redesigned and it no longer crossed the old town. Cave was for centuries a fiefdom of the Colonna and it was affected by the many conflicts the Colonna had with the popes. In particular in 1501 the small town was set on fire by Cardinal Francisco Borgia, a relative of Pope Alexander VI and in 1541 it was plundered by the troops sent by Pope Paul III because the town had failed to pay the hearth tax, which the Pope had reintroduced, abolishing an exemption granted by Pope Martin V (of the Colonna family). This explains why most buildings have a late XVIth century appearance. Palazzo Colonna (now a private property split into flats) is surrounded by other buildings, but its hanging garden is visible from most of the narrow streets of the old town. In 1557 at Palazzo Leoncelli a peace was signed between the Colonna, supported by Don Fernando Alvarez de Toledo, 3rd Duke of Alba, governor of the Spanish possessions in Italy and Cardinal Carlo Carafa, nephew of Pope Paul IV. In the market-place of Cave stands a column, the actual, as well as heraldic, emblem of the Colonna, whose ancient fief this place is. Gregorovius. The column was relocated in 1905. The church was founded in the XVth century, but it was greatly modified in the late XVIIIth century. The image used as background for this page shows a mermaid with two tails, the symbol of the City of Cave, but a heraldic symbol of the Colonna too (you may wish to see the mermaids of Fontana dei Quattro Mori at Marino). Today the large majority of the inhabitants of Cave live outside the old town on a terrace to its east. The development of this area started in the late XVIth century when a Franciscan monastery dedicated to St. Charles Borromeo was founded. Three monks who were brothers and belonged to a local wealthy family promoted the construction of a fine church which was completed in 1640. 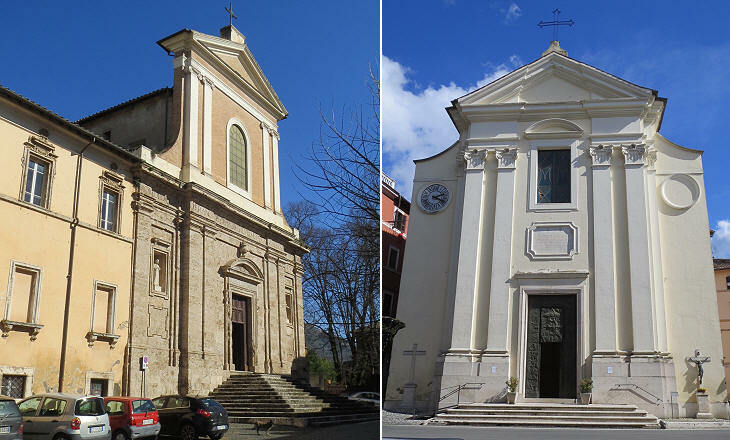 A second church (S. Maria Assunta) was built in 1761 between the old town and the monastery. 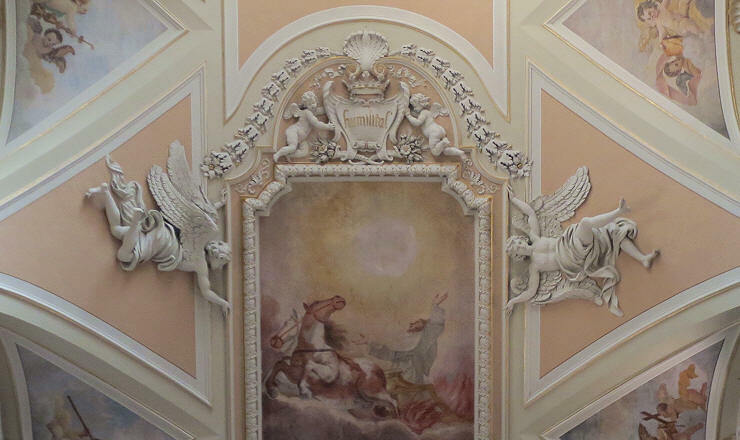 The ceiling was decorated with stuccoes framing a painting in 1680, immediately after the ceiling of Chiesa del Gesù had been completed and it shows the influence the former had in the design of the floating angels. 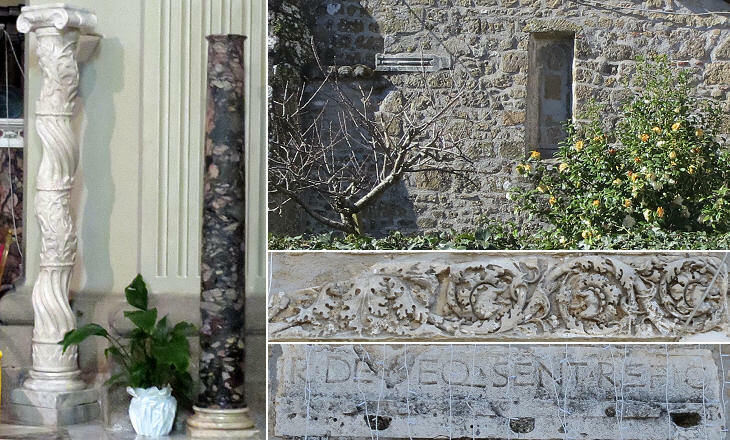 The Colonna donated two Solomonic columns they had received from the Pope after the victory at Lepanto which were said to come from the Temple of Solomon. 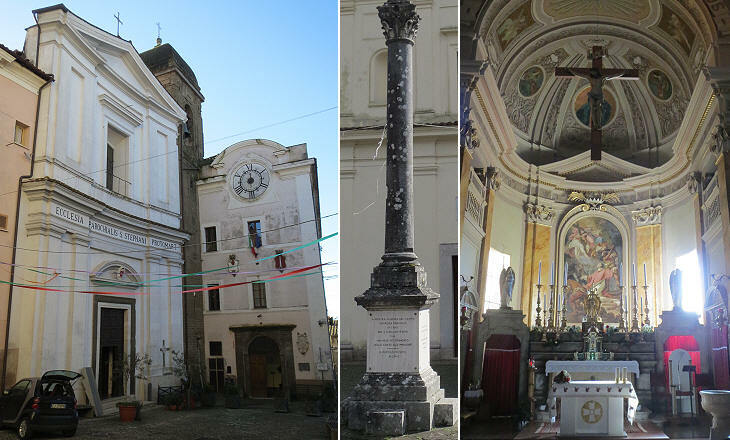 Other ancient columns at S. Carlo came from Santuario della Fortuna Primigenia at Palestrina.